Born and raised in the Highlands of Scotland, Ramsay currently lives in Portland, Oregon. Writer, brewer and public speaker, he is a leading expert on spirits and craft beer. He was the American correspondent and contributing editor for Britain’s Whisky Magazine, craft beer columnist for the Portland Oregonian and editor-in-chief of Sláinte, the Journal of the Classic Malts Society. (Along the way, Ramsay was manager of North America's first brewpub, created and managed the BridgePort Brewpub in Portland and conceived the original BridgePort Blue Heron Pale Ale.) His articles about spirits, cocktails and beer have appeared in The Whisky Advocate, Santé Magazine, Cigar Aficionado, and the Oregonian’s A&E magazine. His manuscript on the history of Scotch whisky was the subject of a bidding war between five leading New York publishing houses. His most recent book project was contributing editor for The Definitive World Guide to Whisky, published by Britain’s Dorling Kindersley. Ramsay wrote the American and Canadian chapters for this award-winning book. The book’s awards include a prestigious James Beard Award for best spirits & wine publication, and “Best Spirits Book” in the Gourmand World Cookbook Awards, France. Ramsay is a Life Member of the prestigious Keepers of the Quaich Society, an international organization which honors those who have contributed greatly to the success and nobility of Scotch whisky and Scotland. Ramsay has also been inducted into the Honorable Order of Kentucky Colonels for his writing about Kentucky Bourbon and Kentucky. 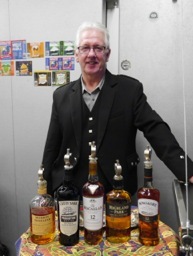 A Certified Specialist of Spirits (CSS), he’s been a judge at Whisky Magazine’s Best of the Best Whisky Awards, held annually in Bardstown, Kentucky. In 2003, Ramsay was a nominee for the best drink journalist in the World Food Media Awards. Portland’s Willamette Week newspaper nominated him “The best person to drink with in Portland.” He has a bagpipe tune, “Stuart MacLean Ramsay,” (a jig) named after him for his contribution to the Pacific Northwest’s pipe band culture. Most recently, Ramsay served as Curator for Portland’s Multnomah Whiskey Library, overseeing the multitude of spirits and the education and events program. "My journeys have taken me to such intoxicating whisky regions as Speyside, Islay and the Kentucky Bluegrass, where I have discovered the virtues of single malt Scotch whisky and Kentucky Bourbon. And I’ve been pleasantly sidetracked along the way with Northwest craft beer, tequila from Jalisco and a plethora of spirits and cocktails. In my travels to distilleries around the world and in conversations with owners, managers and workers at these stills, I realized that lasting memories and real value go beyond the quality and flavour of a well-made spirit: A perfect dram is integral to the culture of the place and the people who produce it. It is about friendship and gathering places, food and music, literature, history and customs. Ramsay’s Dram is the culmination of a lifetime of research and travel and above all, the enjoyment of whisky, people and places." "The Picts were the early, indigenous people of Northern & Northeast Scotland, primarily. They created hundreds of carved stones with symbols that included eagles, salmon, bulls, horseshoes, mirrors, and mysterious creatures such as ‘The Pictish Beast’. It dates from around the 7th century A.D. My family roots are in Northeast Scotland, a mixter maxter of fishing folk, farmers and stonemasons, and I’ve chosen the ‘Beastie’ as the symbol for Ramsay’s Dram."